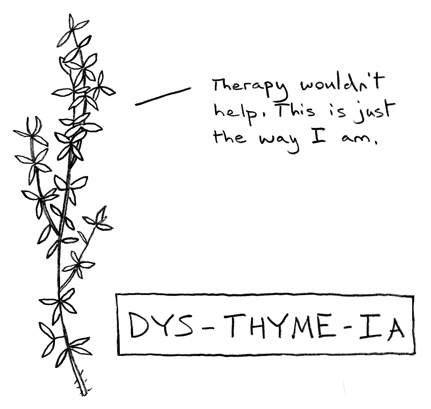 The words thyme and dysthymia are not related, it seems. According to Merriam-Webster’s New Collegiate Dictionary, the former is from the Greek thymon, which refers to fumigation, I assume because the herb was burned, and the latter is from the Greek thymos, which, according to Wikipedia, “is a Greek word expressing the concept of ‘spiritedness’ (as in ‘spirited stallion’ or ‘spirited debate’). 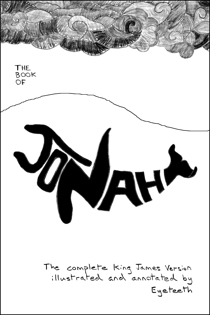 The word indicates a physical association with breath or blood and is also used to express the human desire for recognition.” Dysthymia, therefore, refers to a defect of the mind or the soul, a damaged spirit—and, in the “physical association with breath or blood,” perhaps a defect that damages the entire organism, that pollutes each breath and each heartbeat. Dysthymia, a badness of the soul. As any dysthymic knows—and my dysthymia comics are the most popular on the site, so I guess there are a lot of you out there—dysthymia does its best to convince you that it doesn’t exist, that it is merely an aspect of your personality. It is like an octopus camouflaging itself to look like part of a coral reef. But, like the octopus, it is a separate entity; it’s not a real part of you. And even if it were, why need that mean that you have to live with it? Your hair color is a part of you, and you can change that! So don’t listen to the dysthymia, the dysthymia is lying to you.